First post of 2009! What an honor! xD 2009 is already among us, let’s hope for the best! And on this first day of the new year, I bring CLAMP new year’s messages taken from their private boards. This year CLAMP’s life as creators reaches its 20th anniversary at last. My best regards this year too. This year we welcomed the new year at Ohkawa’s place. I had taken a short nap, but I woke up just in time to see the new year’s arrival (laughs). Thank you everybody for sending e-mails with new year’s greetings. We will answer later. This year marks our 20th debut anniversary, working as creators. All of our meetings have been treasures. so everyone, please take care of us. 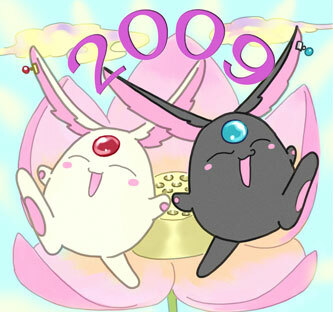 To everyone, I hope that 2009 will be the utterly most happiest year ever. Sorry for saying something so ordinary. A new year is starting. I think we all have our own kind of year, but I hope this one will be good for everyone. Let’s treat each other well. And so I spent the last day of the month, and the year, with food at *Nanako-boss’ house. It looks like it’ll be a good year. Big thanks to usomitai‘s kind help with the translations! Too bad they broke the tradition this year by not doing any drawings with the chinese year animal (this is the ox year in the chinese horoscope). romanchan let me know about a couple of things I would like to share. The first is a review of MUTUALITY: CLAMP works in CODE GEASS artbook. I haven’t seen anywhere where you can download the full artbook (if you have, please let me know!_ but in this review there are a few pages in huge resolution (just download the 320 MB zip file). The other thing is a trailer of Card Captor Sakura Blu-ray box that was shown in Comiket last year, the quality is not the best since it was cam-recorded. The Clow arc will be released in March and Sakura arc in June. But will they be continuing Legal Drug? C’mon, CLAMP, spill! This time they didn’t mention GD, unfortunately. I want CSS in the US! Ahem, thanks for posting the messages, I would have absolutely no idea of what they were saying if you didn’t translate these things. That would be really nice, to get those Blu-ray outside Japan. Wow! I’m just one year older than CLAMP, yay~! So cute their messages, especially Mokona’s. Nanako-Boss hahahaha so kawaii. It’s pitty that They didn’t draw an Ox drawing, it’s my chinese zodiac sign and I would like to have seen an ilustration of Doumeki with Ox’s Hornes, or Kuro-sama. well i will be there soon too ;___________; at least in 3 years i will be in good company ! !